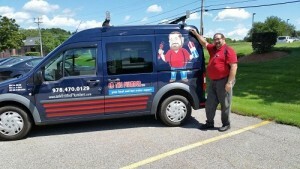 With over 38 years of professional plumbing experience in and around the Merrimack Valley, Ed the Plumber (a.k.a. Ed Kelley) has focused his local plumbing company business on building happy customers by providing excellent service and precise work. After graduating from Northeastern University with a Bachelor of Science in Industrial Engineering, Ed began his career in the electronics and nuclear submarine industries, focusing on work-flow process and efficient equipment layout. Whether you’re planning a complete kitchen and bath renovation project or looking to upgrade your heating system, Ed the Plumber has the practical plumbing and engineering experience to design and implement the most comprehensive and efficient plan for your home. In addition to building happy relationships with thousands of satisfied customers, Ed is recognized by his professional peers and is President of the Plumbing, Heating and Cooling Contractors of Massachusetts (PHCC, MA Chapter), the oldest professional trade association in the country providing education, mentoring, and advocacy for its members. He has been an active member of the Merrimack Valley Chamber of Commerce for over 20 years and contributes to the Boston North Business Association and the Merrimack Valley Chapter of BNI. Ed also gives back to his local community through his work with the Greater Lawrence Kiwanis Club. Offering an established presence in the community, a reputation for the best customer service and the expertise you want for your heating and hot water systems, you can feel confident when choosing.